US, 1960, 125 minutes, Black and White. Jack Lemmon, Shirley Mac Laine, Fred Mac Murray, Ray Walston, Edie Adams. 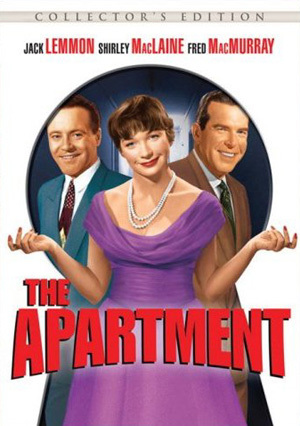 The Apartment surprised many people in its winning the Oscar for the best film of 1960. Billy Wilder also won the Oscar as best director. He had previously won this award for The Lost Weekend in 1945. The Apartment is a serious kind of comedy, ironically critical of surface American morality. It portrays people externally respectable yet behaving in a way that, if it were known, would merit condemnation. The double values and double standards are poked fun at as well as criticised. Jack Lemmon and Shirley Mac Laine won Oscar nominations for their roles. Both were to work with Billy Wilder in Irma La Douce. Jack Lemmon has been directed by Billy Wilder in such films as Some Like It Hot, The Fortune Cookie, Avanti, The Front Page. The film has a literate script, strong characterisations, and an incisive presentation of some of the issues that lurk beneath the surface of a respectable America. 1. This is considered a very successful film. Do you agree? Why? It won an Oscar for the best film of 1960. 2. The title's focus of attention on the apartment? The apartment as a symbol? The tone and overtones of this title? 3. As a comment on American society, big business, success, individuals in their struggle for room at the top? How interesting an American picture was this? 5. What did the film have to say about individuals in relation to corporations, society, America? The questions of principles and morality? The quality of success? The ironic comment of the ending and individuals standing against society? 6. How attractive a hero was C.C. Baxter? Jack Lemmon's portrayal of the ordinary man? His apartment as expressing himself? The quality of his work? His virtues as an executive? Making a vice of his virtues? His doublethink about success and the apartment? His suffering in the cold waiting for the men to leave etc.? His reputation amongst the neighbours? Stifling conscience and enjoying promotion? Being considered executive material under false pretences? Being smart, gaining money, and outsmarting himself: falling in love, and in going for the boss and allowing him the apartment? The reversal of his fortunes? The night out, because of his disillusion with Fran? C.C. Baxter as a comic figure, as a tragic figure? As learning responsibility? His changing? As learning happiness even in being jobless? The American innocent at heart, too soft at heart? The insight into a modern man and his capacity for good and evil and his confronting them? 8. The sardonic picture of U.S. executives in Sheldrake? His efficiency in his work, his double talk to C.C. Baxter, his smooth talk in getting the key, his appearance of respectability? His use of power for his own purposes? His infidelity? His selfishness as - regards Fran? The ironic telephone call and his disregard of Fran's suicide? As fearful and selfish for reputation? What judgement was being made of big business? 9. The importance of the executives' washroom - as a symbol equivalent of the apartment? The prestige of getting there? Dobisch as a man of the washroom -as a man of the apartment? The attack on the ethos of business via the washroom? 10. The portrayal of the executives' offices, the typist pool - the importance of the long sequences showing the vastness of the typist pool? The personnel involved in American business? 11. The background sequences of cafes, bars? The minor characters like the blond, the girl taken out by C.C. Baxter etc.? How well did they fit into the whole film? Their comments on the situation? 12. The office party and the tone of this? What did it mean and symbolise? 13. The film as a modern morality play? The values that it stood for? Its attitude towards traditions and morality? The impact of the comedy and the drama? Black and white photography, wide screen, techniques? The sharpness of the wit and the dialogue etc.? Is The Apartment an important film?